With the birth of archaeology in the nineteenth century, collectors of stone tools began to organise them into types of tools and groups of types, and the naming conventions for this categorisation was often based on the form of the stone tool and sometimes on its assumed use. Over the years, different local and regional groups of stone tool types were named, very often after the area in which they were first found – Mousterian after Le Moustier in the Dordogne, France; Clactonian after Clacton-on-Sea in England; and Acheulian after Saint-Acheul in northern France. As other similar groups of stone tools – very often called lithic industries, but now also called lithic traditions – over the years these groups were assigned to categories, so that Mousterian industries identified in France were soon discovered across Europe. These different ‘industries’ were eventually viewed by archaeologists as being different distinct cultures, and the appearance of an industry in one area was taken as evidence for the movement of human groups, and the spread of cultures. Over the years, a bewildering array of names for these stone tool groups built up. Not only that, researchers in one area might use one name for one set of tools, in another area the same name might be used for a somewhat different group, thus leading to confusion and muddling. Clark’s system of five lithic technology modes is still used today, however after 50 years the limitations of the system for making sense of stone tools has been revealed as more and more stone tool assemblages have been uncovered and analysed, especially for lithic traditions outside of Europe where the system was based on (Shea, 2013). Also, the modes are divided into groupings based on aspects of morphology of the stone tools, but not on how they were made; the categories are sometimes too broad, and sometimes too specific (Shea, 2013). The main problem, however, is that it is used to study the evolution of stone tool types, so it categorises lithic assemblages based on their most “derived” technological part, i.e. that part supposedly lacking in earlier assemblages. The problem with this is that later, more ‘evolved’ stone tool assemblages of Mode 2, will still use attributes from Mode 1, simply because parts of Mode 1 are useful and pragmatic in a stone tool kit. Therefore a strict progressive system based on evolution in stone tools doesn’t necessarily work. Shea (Shea, 2013) attempted to overcome these limitations, and has devised a lithic mode scheme with nine main groups along with eight sub-groups, giving a total of 17. This increase from 5 to 17 modes highlights the complexity see in the archaeological record. Percussors – pebbles or cobbles (this includes rock fragments that aren’t rounded) with damage from repeated percussion, such as hammerstones, pestles, anvils, pitted stones. Bipolar cores – pebbles or cobbles that have been knapped by striking the rock on top with another rock, thus fracturing it multiple pieces. Pebble Cores / Non-hierarchical Cores – pebbles or cobbles that have been struck by another hard material, producing flaked edges. 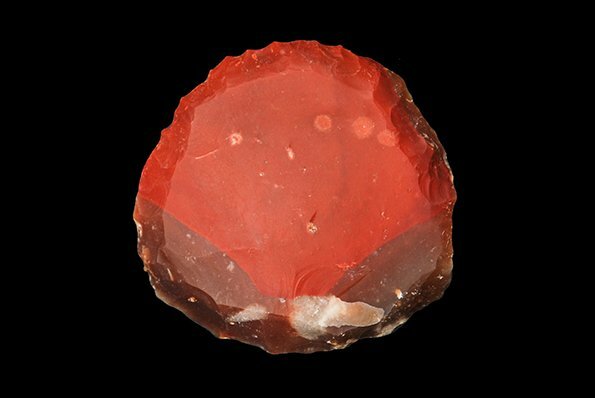 Cores conventionally described as choppers, chopping tools, discoids, and polyhedrons are pebble cores. Clark, G., 1969. World prehistory: A new synthesis. Cambridge University Press, Cambridge.